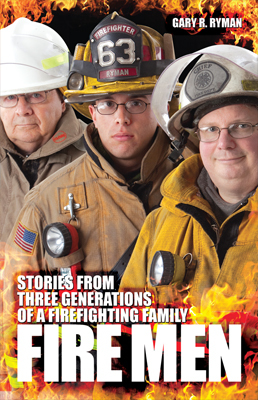 Fire Men: Stories From Three Generations of a Firefighting Family relates the experiences as firefighters of my father, myself, and my son. As both the son and father of firefighters, I bring a different perspective. Having the opportunity to fire fires, with both my father and my son as well as respond to auto accidents, and the myriad other emergencies that fire departments handle was marvelous. I can’t say it really started in my mind as a book. I began writing out the stories of individual emergency calls with the thought that perhaps sometime in the future the vignettes might be of interest to my son or daughter or perhaps a future generation. After I had a hundred plus pages of this material, it dawned on me that perhaps this was a book trying to get out. About four years from pen touching paper to holding the first printed copy. The first draft took just over a year. It wasn’t remotely ready, but I didn’t know that at the time, and with the encouragement of some friends, I began the querying process. 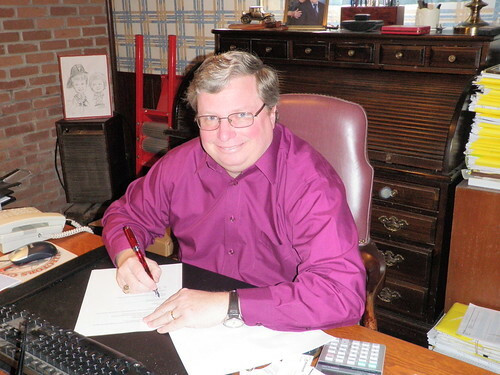 One of the agents I wrote had represented an author I liked a great deal. A few weeks after sending my letter, I received an email from another agent at that firm indicating that the first agent was not interested; but that my query had intrigued her and she wanted to read the manuscript. After reading it, she agreed to work with me and provided incredibly valuable feedback and suggestions which I incorporated in a second draft. A few more rounds of revisions followed and just before she was ready to start sending the manuscript out, I was orphaned—she left to take a job as an editor at one of the big six houses. Not surprisingly, the agent she passed the manuscript who decided it wasn’t for him, and so I was back to square one, albeit with a much improved book. 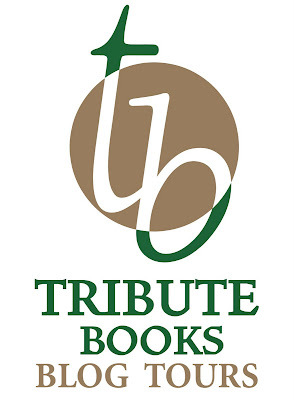 This time, along with agents, I looked at small publishers as well, and was lucky enough to hook up with a wonderful publisher, Tribute Books http://www.tribute-books.com/ They have since transitioned to YA books, but continue to strongly support their entire list, and have been just fantastic to work with. I just submitted my thesis for my Masters in American History. That has been consuming me for most of the past nine months. Now I hope to return to the novel I began shortly after publication of “Fire Men” which is an action adventure genre work, naturally set in a fire department. 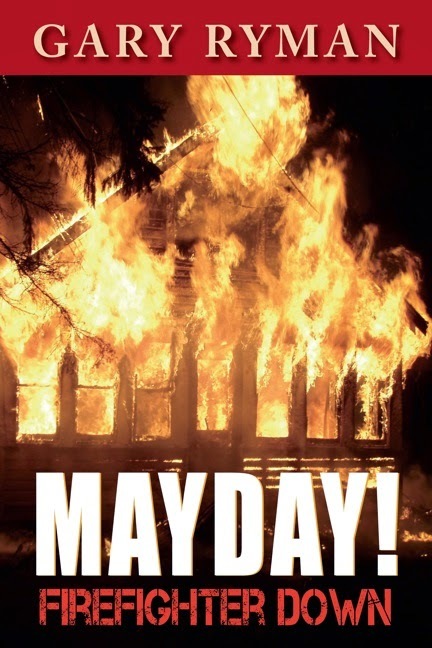 A Lieutenant dies while battling a fire which was deliberately set in an insurance fraud scheme and his best friend and brother-in-law who leads a ladder company in the same department searches for the arsonist. I read mainly history or action/adventure. When I wrote the book, I used real names to allow me to keep track of people and try to ensure I captured their personalities. In the revision process, though, the majority of the names had to be changed. I stole an idea from a writer’s seminar I attended, and bought a baby name book, and reworked the names from that. While I can’t say for everyone in the book, I would certainly be willing to settle for being played by Brad Pitt. The resemblance (not) is so close! The publisher took care of the cover, and I think did an incredible job. I was stunned the first time I saw it, and could not have been happier. Folks can visit my website for more information. The book is also available in paperback on Amazon.com as well as Barnes & Noble and in virtually all e-book formats. 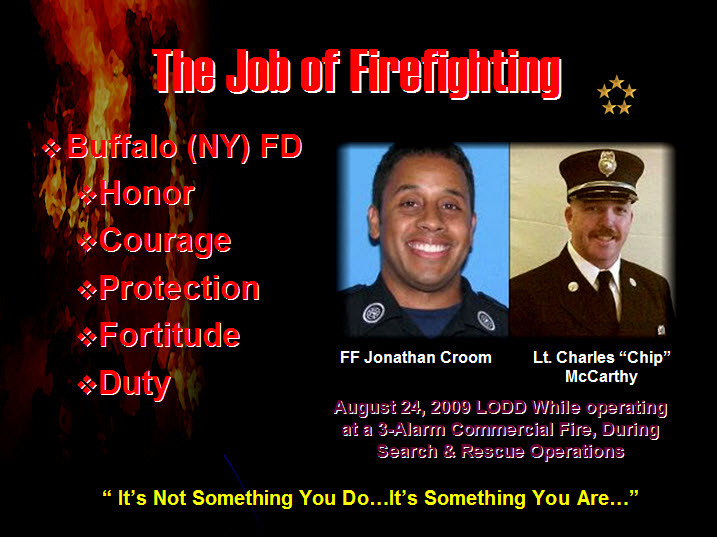 In the early morning hours of August 24th, 2009, the Buffalo Fire Department was dispatched to 1815 Greene St. for a commercial building fire with reported people trapped. The building was heavily secured, but crews were able to access the first and second floors to conduct primary searches which were negative. Access to the basement, however, presented difficulties due to a heavy steel door with multiple deadbolts. Thirty minutes into the incident, firefighters were ordered out to regroup and make a specific attempt to breach the basement door on the bravo side of the building. Lieutenant Charles “Chip” McCarthy from Rescue 1 and two other firefighters entered the first floor Deli area from the alpha side to verify that previous crews had exited the building. McCarthy was ahead of the other two firefighters and following a hose line when a collapse occurred. The Lieutenant fell into the basement. Shelves fell onto the other two firefighters who also noted deteriorating conditions, and exited the building, unaware that McCarthy had fallen into the fire below. Lieutenant McCarthy activated his PASS alarm and made several MAYDAY radio calls, but his identification and location were not known. Firefighter John “Simeon” Croom of Ladder 7, part of the rapid intervention team (RIT), reportedly believed he knew where the Lieutenant was located and entered the structure while other team members worked on the bravo side. Other firefighters followed the hose line in on the alpha side and discovered the collapse. 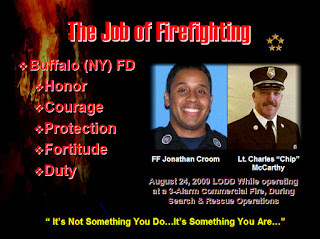 Lieutenant McCarthy was identified as the missing firefighter during the first accountability check, but Firefighter Croom was not identified as missing until a third such check fifty plus minutes after the initial MAYDAY. Ultimately, three alarms were struck for the fire. For the next three hours, a major effort was made to reach the collapse area. Fire conditions and structural concerns limited the ability to reach the victims. The wall on the delta side was breached to gain access to the collapse area and the department worked to shore this exterior wall and the floor in the deli area. After control of the fire, Lieutenant McCarthy and Firefighter Croom were located, side-by-side in the basement without face pieces on and with SCBA bottles empty. A subsequent NIOSH report included the following recommendations. · Ensure that all personnel are aware of the dangers of working above a fire, especially a basement fire, and develop, implement, and enforce a standard operating procedure (SOP) that addresses strategies and tactics for this type of fire. · Ensure that the incident commander (IC) receives interior status reports and performs/continues evaluating risk-versus-gain. · Ensure that crew integrity is maintained at all times on the fireground. · Ensure that the incident commander (IC) receives accurate personnel accountability reports (PAR) so that he can account for all personnel operating at an incident. · Ensure that a separate incident safety officer, independent from the incident commander, is appointed at each structure fire. On the third anniversary of their passing, may the brothers’ rest in peace. We need a partial shift in balance to begin better educating the younger firefighters as to the desirability of residential sprinklers. 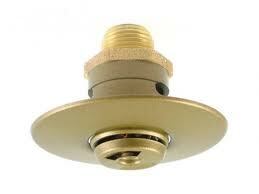 For the most part, their response to commercial sprinkler alarms and fires is something they accept as common and normal. The expansion of residential sprinklers, however, is newer and something which reduces the size and number of their bread and butter—the house fire. Understanding is one thing, but acceptance is another. Sliding the scale so these aggressive young men and women buy into the importance and value of these systems is a critical leadership task. It is difficult to see, accept, and support technology which if (or hopefully when) it becomes widespread, can eliminate much of the reason many of us came into this business to begin with. It’s like the people version of steam replacing the sail or the car replacing the horse; not gone, but much reduced. Just the same, pushing for these systems over the construction industry lobbyists and their pocket politicians should be continued. That, and educating the younger generation of firefighters— so they can succeed where we haven’t. 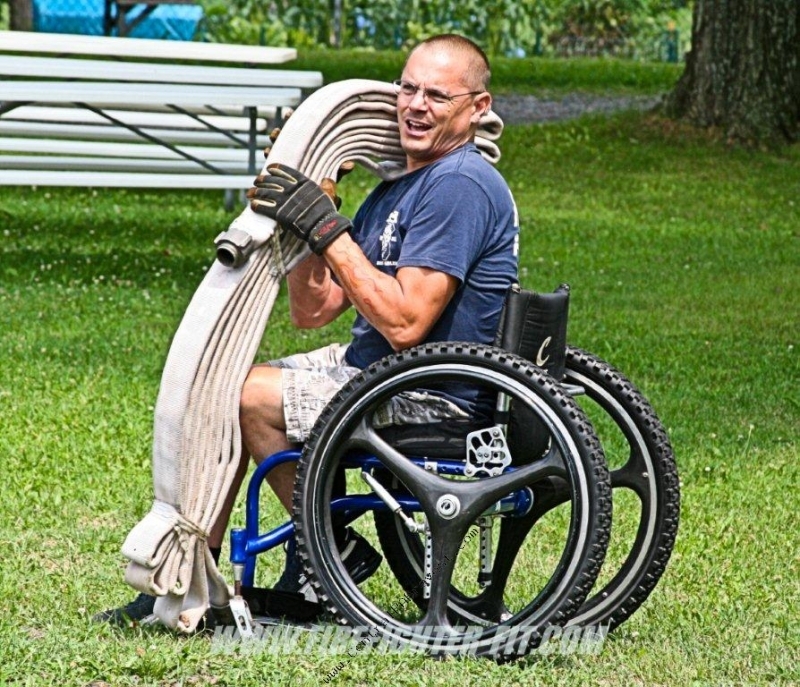 I recently saw a marvelous story by Firefighter Matt Miles from CentralPABravest that I had to share. Mark was diagnosed with Transverse Myelitis at the young age of 14 after not being able to get out of bed one morning for school, Transverse Myelitis is a viral infection that inflamed Mark’s spinal cord and landed him in a wheel chair for life. This did not stop Marks curiosity of becoming a firefighter at the young age of 15, only one year after being confined to a wheel chair. Mark did so well and enjoyed the work we do so much he ended up holding the positions of President, Vice President and his current position on the House Committee. Mark also takes an important position on the fireground with Accountability, Safety and changing SCBA cylinders out. It was also reported to me that Marks Brothers chocked his wheels at a working fire and he was able to flow a line and knock down some fire at a defensive operation!! Along with taking physical fitness very seriously Mark is also a huge advocate of education in the fire service and holds numerous certifications. But Mark has a request for the State Fire Commissioner Edward Mann. Mark has a serious desire to be able to obtain the Certification of Firefighter 1. 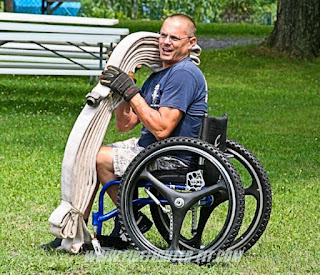 Mark understands he is limited due to his disability and will go to any lengths to work for his practical portion of the certification. Mark wants this for personal and one other reason, to hold other firefighters accountable on getting their FF1 and set an example that anyone can do it! Thanks to Matt for sharing this great story. Communications integrated into the helmet and face piece. The tinny speakers in masks never worked right and it’s ridiculous to try to talk through face pieces. Extension microphones are actually getting bigger, not smaller, unlike every other piece of technology in the world. An infrared heads up display in the face piece. There are no reasons that every firefighter shouldn’t have a camera, and no reason you should have to carry the thing. Apparatus designs in which hose and equipment can be reached from the ground. This isn’t so much reengineering as it is going retro. When I started, you could reach the pre-connects in the rear from the ground, and standing on the tailboard, you could see the driver. There is no reason we need ladders on apparatus to reach our own equipment. You shouldn’t have to practically set up scaffolding to reload the hose bed. C’mon folks; we had guys walking around on the moon in 1969; there is no reason we can’t have these simple items on a cost effective, and importantly, firefighter proof configuration.